Then again, there’s something about lazing about in my pajamas for the three days following the holiday and devising ways to use up the leftovers that’s incredibly appealing. Fleece pjs and turkey corn chowder make the world go around! 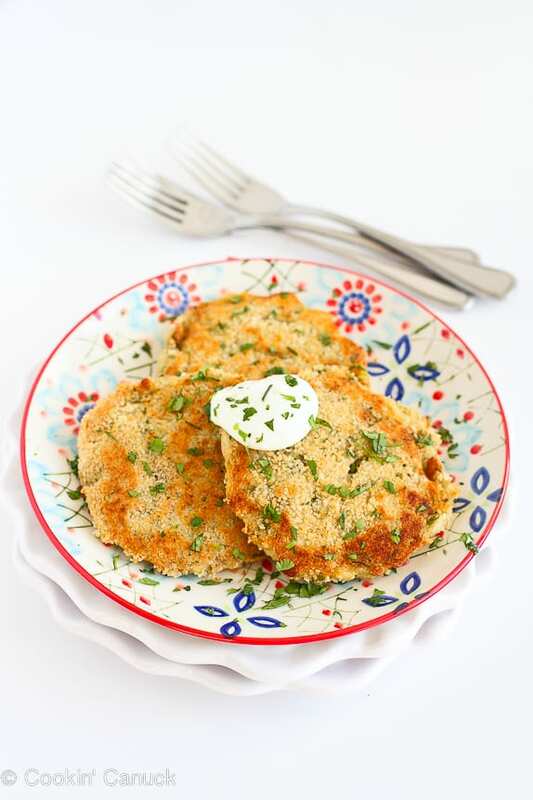 I’ve made my share of potato latkes (zucchini ones, too) in previous years and finally figured out the best way to bake them (in other words, no oil needed) and still achieve that beautiful golden brown, crunchy crust that can make or break a potato pancake. This mashed potato patty recipe is based on that method, and the keys to success are simple…use a hot oven and preheat the baking sheet for a few minutes to achieve a sear on the outside of the patties. These are fantastic with just a bit of cheese added in, but I decided to “up” the flavor by mixing in some green chiles, cumin and cilantro. It was worth the few extra minutes of prep time! 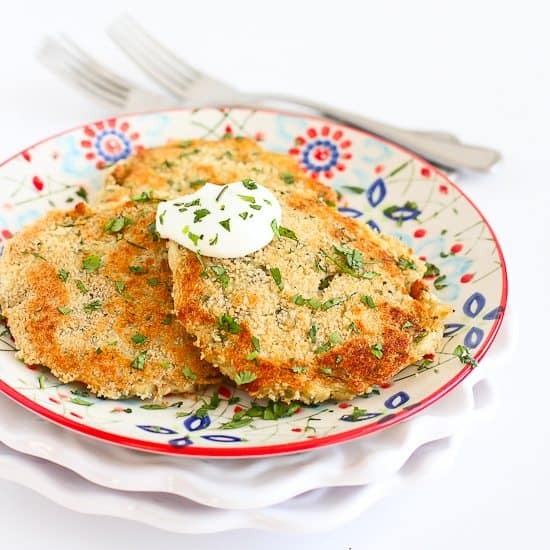 Since the added ingredients are all used in small portions, the nutrition profile of these potato patties really depends on the mashed potatoes that you use. I always use my recipe for Creamy and Low-Fat Mashed Potatoes, which makes this recipe low-fat and low-calorie. Serve the patties with whatever strikes your fancy. A few options are plain Greek yogurt, hot sauce or even ketchup. 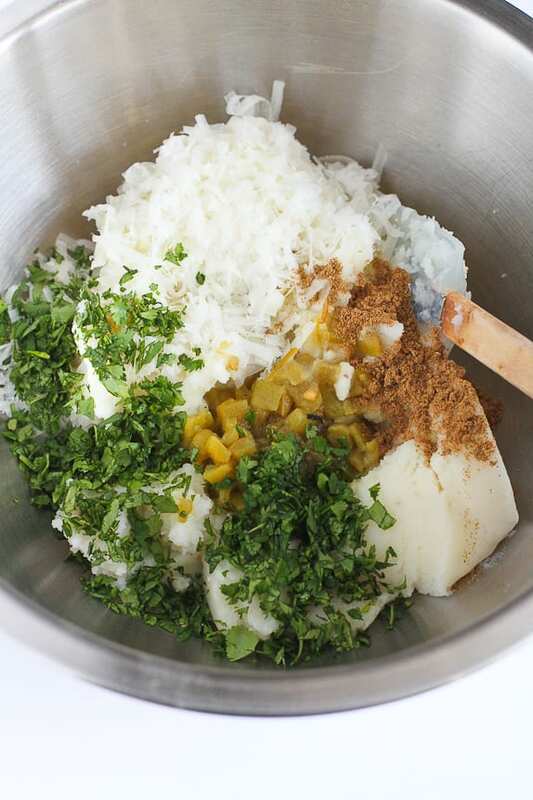 In a large bowl, mix together the mashed potatoes, 1 egg white, green chiles, Parmesan cheese and cilantro. In a small bowl, whisk the remaining egg white. In a separate bowl, mix the breadcrumbs and pepper. 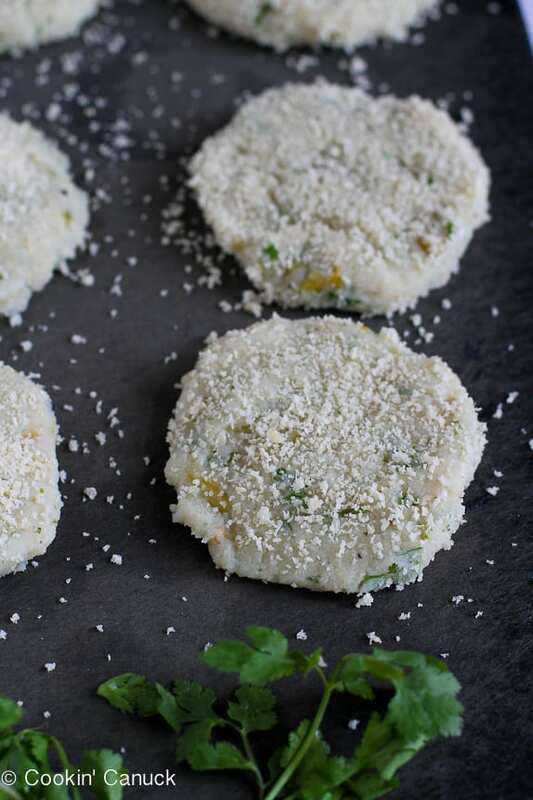 Using rounded ⅓ cup portions, form the mashed potato mixture into patties. Place the patties on a cutting board. Dip each patty into the whisked eggs white, then the seasoned breadcrumbs and place on a flat surface, such as a cutting board. Place the prepared baking sheet in the oven and heat for 5 minutes. Carefully remove the baking sheet from the oven and quickly place the patties on the sheet. Return to the oven and cook until the patties are golden brown, about 15 minutes per side. Garnish with cilantro (if desired) and serve. This post was originally published on November 21, 2014, and has been updated. I love having leftover mashed potatoes to play with. Awesome recipe! These look so delicious! What a great idea for leftover mashed potatoes! Great idea for left over mashed potatoes, adding cheese was super smart! Great use for leftover taters! I love reusing leftovers. These is perfect! I’d make extra mashed potatoes just to be sure I’d have enough for this delicious leftover recipe! Yum! Oh, these are pure comfort food. Leftover mashed potatoes is an oxymoron in my house, but I’m willing to make a batch specifically for these! 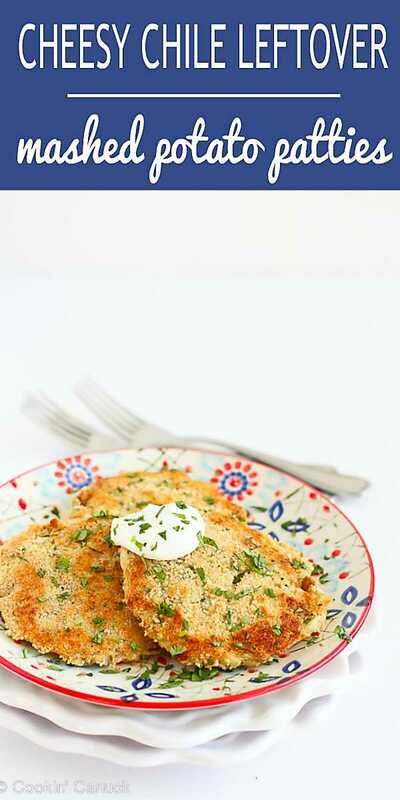 What a fabulous way to use up leftover mashed potatoes!! love this!! Awesome way to use up mashed potatoes. I can think of a bunch of meals where this would be a fine accompaniment! so this is What you do with leftover mashed potatoes! Delish! My dad always made patties out of his leftover mashed potatoes. Love this! This sounds great. Step 3 mentions mixing the remaining egg white in a separate bowl but there’s no mention of what to do with it. We’ve already mixed the 1 egg white with the potatoes and there’s no mention of a second egg white. Typo or do you dip the patties in it before dipping in the bread crumbs? Hi Susan, I apologize for the confusion! 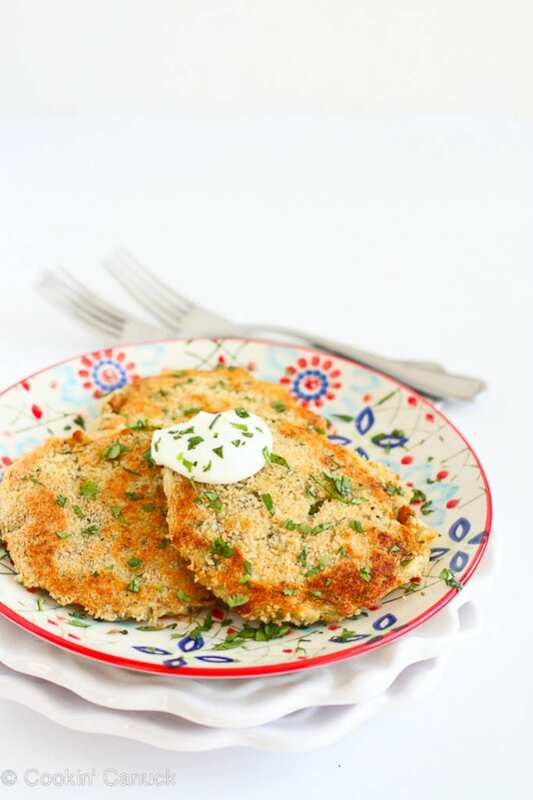 You are exactly right – you should dip each of the potato patties into the whisked egg white, then the breadcrumbs. I edited the recipe to reflect the correction. Thank you for catching that!